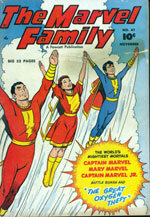 Someday, somewhere, I'll tell you the story of how I got my grubby little mitts on a handful of Fawcett comics from the forties and fifties roundabout 1965, giving me a half decade head start on others of my generation in appreciating the sublime delights the Big Red Cheese and his extended family could provide the four-color enthusiast, but not here, not now. Instead, let's just muse upon the glorious simplicity of this cover image, shall we? Three brightly colored individuals soaring high up amongst the clouds in the sky--each with a big, warm, winning smile plastered across their faces!?! 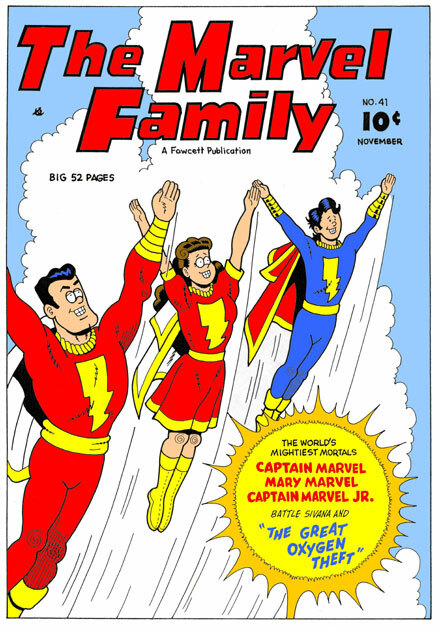 My goodness, is it any wonder DC comics could never quite figure out a way to successfully update such a charming character as the original Captain Marvel without alienating their core, contemporary audience, a group who seems to be looking for anything but overgrown Boy Scouts as their heroes?? 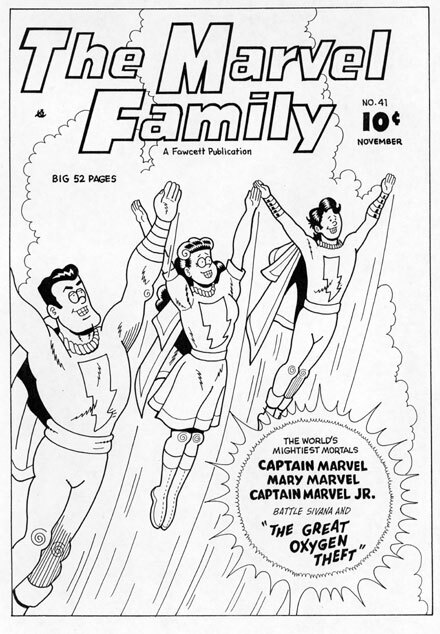 (Though, to be fair, I thought the Jerry Ordway helmed attempt did a reasonably decent job of appealing to fans both old and young alike.) One wonders what would've happened if the Captain and his relatives hadn't been coerced to close up shop back in 1953, waiting almost twenty years before returning from their banishment to comics limbo. Had the feature run continuously over those years, it would've surely grown and metamorphosized organically. Most likely, it would've been a radically different animal than what it was when it shut down at the outset of the fifties.